The irony is that many of the people who admire Pinker consider themselves New Atheists and skeptics, yet it doesn't seem to bother them at all that not only does Pinker make extremist claims sans evidence, but also proclaims his opinions to be "the truth." And if you point out that Pinker has a long history of making common cause with the right, and then the alt-right, they will push back on his behalf immediately. Yesterday's NYTimes published an op-ed by Jesse Singal, Social Media Is Making Us Dumber. Here’s Exhibit A.
I wrote an op-ed response and sent it into the NYTimes but I don't know if they will publish it or not. Steven Pinker has long been a darling of the white supremacist ‘alt-right,’” noted the lefty journalist Ben Norton. “And he returns the favor.” Others reacted to the rumor with simple exasperation: “Christ on a crutch,” said the liberal commentator and biologist PZ Myers, who also wrote a blog post denouncing Mr. Pinker for this supposed alliance. 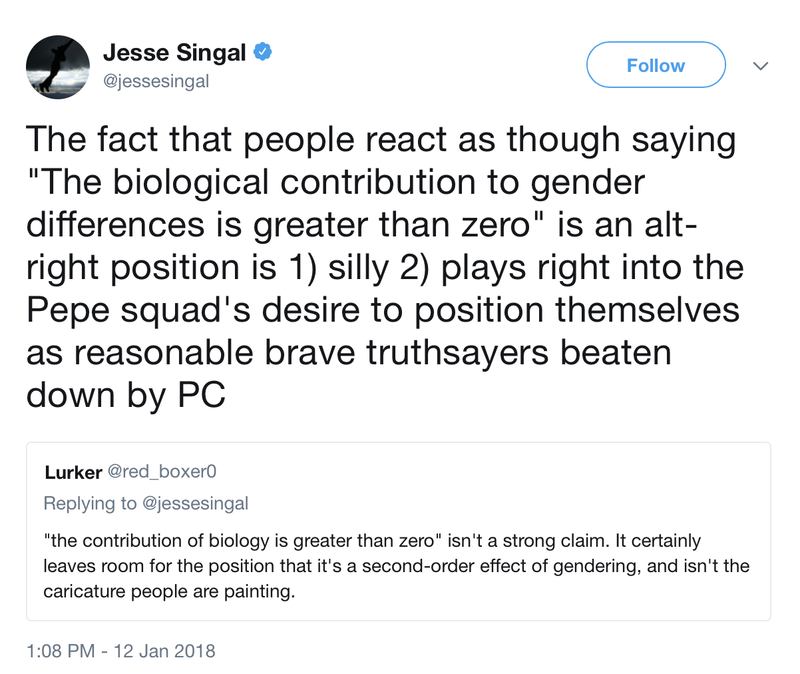 Jesse Singal is a lazy sloppy journalist and that trait is just as apparent in his tweets. 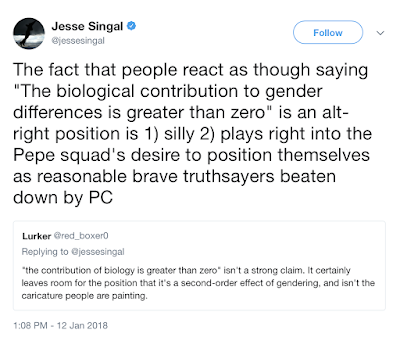 Here he is uncritically repeating Pinker's claim that all he is saying is "the biological contribution to gender differences is greater than zero" along with the claim that there are "people" who react to that as if it was alt-right. Naturally neither Singal nor Pinker provide any evidence there are people doing that. But even more importantly, "greater than zero" is hardly the extent of what Pinker believes. He believes that biological differences are the cause of a variety of social phenomenon. Which is why he defended Larry Summers. Pinker lies on the anti-PC video about the source of the Larry Summers controversy, in the same way. He portrays the Larry Summers controversy as though Summers was punished by simply stating that men and women are different. The actual controversy was that Summers, while the president of Harvard and thus having some power over hiring decisions, suggested at a conference on diversity in STEM that the foremost reason women had less successful careers in STEM than men was because their brains were by nature less capable of STEM subjects than the brains of men. So what exactly were the dire repercussions of Larry Summers proclaiming "the truth"? A few years later Summers went to work for the Obama administration. Apparently the university/media cabal dedicated to withholding the truth is not nearly as powerful as Steven Pinker would have you believe. It's because of lazy, careless journalists like Singal that Pinker has been getting away with making common cause with professional rightwing racists all these years.